Fresh on the heels of an ECB announcement of more QE and the further lowering of the excess reserve rate already at -0.2%, China Nervously Joins Global Easing Campaign. China’s central bank cut benchmark interest rates for the sixth time this year in a bid to support an economy which is forecast to grow at its slowest annual rate in 25 years. The move comes a day after the European Central Bank indicated it would extend its quantitative easing programme and cut its deposit rate in a bid to boost the eurozone’s sluggish recovery. The People’s Bank of China’s actions, combined with Thursday’s ECB announcement and market doubts over the US Federal Reserve’s commitment to raise interest rates this year, highlight a wider nervousness in official circles over the health of the global economy. Expectations for global growth have already been revised down to 3.1 per cent in 2015, the lowest International Monetary Fund forecast since 2009, and analysts are concerned that prospects for next year are also dimming. 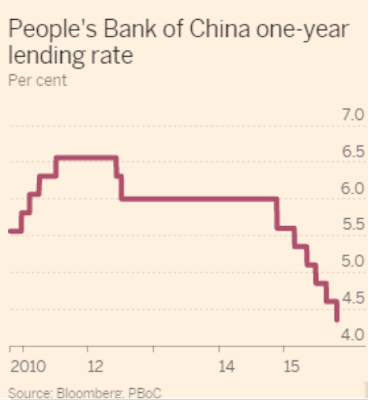 The PBoC said on its website that it was lowering the one-year benchmark bank lending rate by 25 basis points to 4.35 per cent and the one-year benchmark deposit rate to 1.5 per cent — its lowest on record — from 1.75 per cent. The central bank also cut the share of customer deposits banks must hold in reserve, injecting Rmb560bn ($90bn) of cash into the banking system to counteract the cash drain from capital outflows in recent months. The required reserve ratio was lowered by 0.5 percentage points to 17.5 per cent. Official figures released earlier this week showed China’s economy expanded at its slowest pace since 2009 in the third quarter. The data showed the challenges facing China’s leaders in achieving their growth target of around 7 per cent for the year. “We see rising [downward] pressures on [renminbi] and [offshore renminbi] exchange rates as PBoC will find it difficult to strike a balance between monetary policy easing and a stable exchange rate,” Zhou Hao, China economist at Commerzbank, wrote on Friday. That last sentence above on downward renminbi pressures echoes what I stated earlier on currency reserves and the desire to hold yuan. For discussion of this tie-in, please see IMF Prepared to Bless Yuan As Reserve Currency; Reason to Celebrate? Any Real Significance? Global cuts outside the US are the rough equivalent of US tightening. The world has effectively decided the Fed is not going to hike as much as they want (if at all). In response, other countries force the issue by cutting rates and strengthening the US dollar, all in the mad attempt to gain competitive export advantages. In the competitive QE and currency debasement process, central bankers have blown the biggest equity and junk bond market bubbles in history. When those bubbles collapse (and they will, but at an undetermined time), the world will see another huge round of asset deflation, likely accompanied by significant price deflation. In effect, central banks do not see their misguided price deflation and credit stimulus exercises as the very cause of the weak growth environment the world is in.